I love the designs of Karen Walker - I mean, she designs her clothes around themes like space travel, sea monsters and northern soul, what's not to love? But she's New Zealand based and her clothes are so tricky to get hold of over here: a bit on ASOS, a bit sometimes on Urban Outfitters if we're lucky. I have a fantasy of moving to Australasia where I swim a lot in the sea and shop for Karen Walker collections without having to think about shipping fees or import duties. One long term British champion of Karen Walker is the gorgeous Bath store Found (I have a secondary fantasy of moving to Bath, where I swim in the spa a lot and shop for Karen Walker collections at Found). 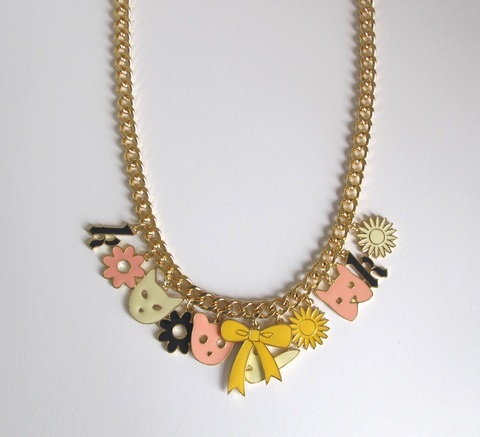 They're currently stocking her jewellery line which is every bit as unusual, humorous and wearable as her clothes. And it's pretty affordable too. This long critter necklace, a joyous collection of enamelled bows, flowers and simplified animals is £35. 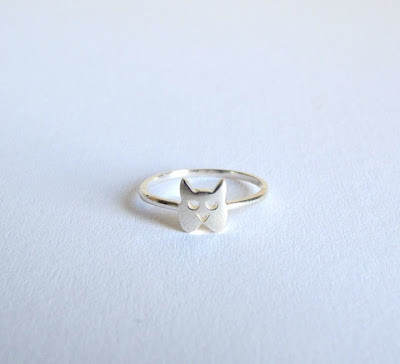 More animal delights come in the form of this subtly sweet sterling silver dog ring, also £35. There are also cat and bear rings available to cover all your creature cravings. One of the reasons I love Karen Walker designs so much is her mixture of tough and sweet. Her designs are whimsical but never saccharine. That's illustrated perfectly by her Runaway dog tags. The dog tags means you can pretend you are in the US Marines or something equally intimidating (grrrr). Look closer and you'll see the plastic tags are layered with a cut-out image of a girl with a knapsack, or an owl (awww). 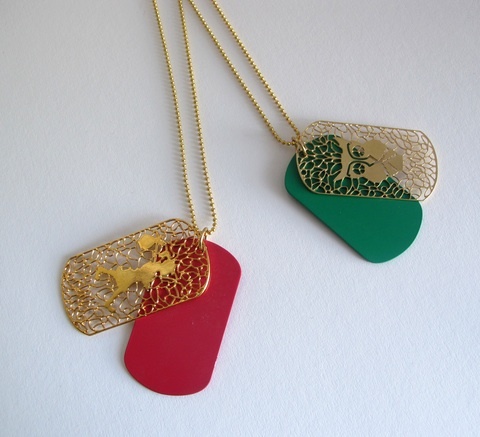 Even better is that these tags are currently on sale, reduced to £19.50 each. There are more expensive items in the range too, such as this Robot Budgie necklace which is priced at £140. 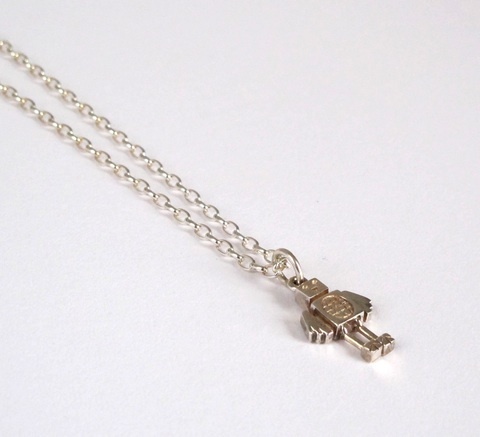 If I'm going to spend £140 on a necklace, I definitely want it to be a necklace of a robot. And one with mobile legs, as this one apparently has. The selection of jewellery is small but it's all so desirable. Happily, Found will also be stocking the latest Karen Walker clothing soon and it's the one with all the cosmic prints. I'm saving my pennies already.